“Anne Marie Smeaton is back in the hometown she hasn’t seen for forty years, trying to live a normal life with her partner and teenage son. But that’s impossible for Anne Marie. Because forty years ago, when she was eleven years old, she did something unspeakable. Something so horrifying that society has shunned her ever since. She’s trying to make peace with her past by telling her story to journalist Joe Donovan. But it’s not that simple. By dredging up memories she usually keeps repressed, Anne Marie is unleashing old nightmares from the past. Suffering from horrifying visions, she sometimes does bad things. Things she has no memory of afterwards. This is a hard-hitting, noir thriller centred around the murder of a child by a child. It gradually peels back the surface layers of a community, and exposes a more sinister underbelly lurking just beneath the surface. I found the multiple plotlines within the story highly intriguing: What did Anne Marie do when she was eleven years old, and why did she do it? Where is Donovan’s son, and can he get him back? What’s the secret that Donovan’s daughter is hiding? Who is responsible for the murders? 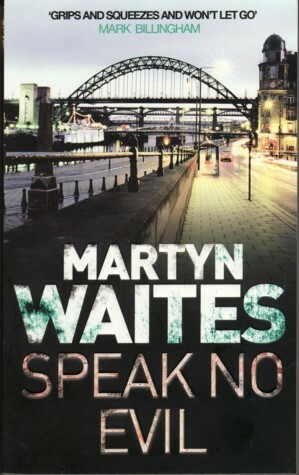 Waites uses multiple point-of-views to tell the story, giving the reader a unique perspective on the present day events, and the history that came before them. From Donovan and his team we see the private investigation, and through Donovan himself the emotional and personal impact of his son’s abduction. While from Anne Marie we discover the situation that drove her to do what she did (and how it still haunts her). The kids on the housing estate show us how life is for them, the unspoken hierarchies of the block and how sometimes life is regarded so cheaply. Then from news-writer Tess Preston we what a big story means to her, and how she’d do anything to get her big break. Each character feels alarmingly real, and as the story twists and turns towards conclusion we see how each element (and character) links together, like an intricately created web. An emotive, rapid paced, rollercoaster of a story it grabbed my attention and had me hooked from the very beginning. Dark, gritty and utterly believable, I devoured this book over a weekend. And yet another great recommendation, thank you!